A man of integrity, modesty, honour and thoughtfulness, the way in which Markus Naslund conducted himself at the rink was paralled away from it. 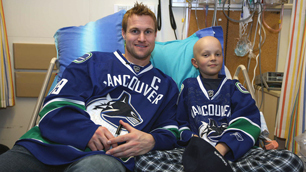 Naslund was the same unassuming and strong leader in how he went about supporting the children at BC Children’s Hospital year after year as he was in the room with the team. In addition to the annual team visit to the hospital, Naslund made countless visits on his own, always requesting that the visits not be publicized to ensure his time spent with the children was special and intimate. “What made Markus different was the level of personal interest he showed in the kids,” said Dr. Gary Lazar, director of Adolescent Psychiatry at BC Children’s Hospital. When Markus met Angela she was 14 years old and suffering from depression, social anxiety, and personal insecurity. Angela had suicidal tendencies and was struggling to find herself. As a patient in the Child and Adolescent Mental Health program at BC Children’s Hospital, Angela was initially shy when Naslund came to visit, but she eventually opened up about a recent game of ball hockey she played with the other patients and doctors in the program. Angela told Naslund she had scored the winning goal, but was quick to give all the credit to her teammates. She billed her goal as a fluke and did not want to accept any recognition for the goal. Without hesitation, Naslund gently challenged her insecurity around taking credit for the goal, asking her a series of questions about the game until she came to her own conclusion that she worked really hard to score that goal. He was able to turn the situation around on Angela to highlight her personal contribution to making the goal happen. Angela’s confidence and self-image soared. During another visit, Kathy Tremayne, program director for the Provincial Specialized Eating Disorders Program at BC Children’s Hospital watched as Naslund got down right down on the floor to play with the kids. In addition to maintaining a connection with the kids at BC Children’s Hospital, Naslund also became a strong advocate for child and adolescent mental health issues. With the goal of overcoming the negative stigma that is often associated with mental health issues, Naslund filmed a PSA in partnership with the BC Children’s Hospital Foundation to help educate British Columbians. After meeting Sandra and her husband at one of the Canucks Dice & Ice events, Naslund sent their son Garrett an autographed Canucks jersey and a package of goodies. Garrett was excited to bring it to school and show his friends. “That was extra special because as a boy with autism, Garrett does not usually care about many things,” said Weal. 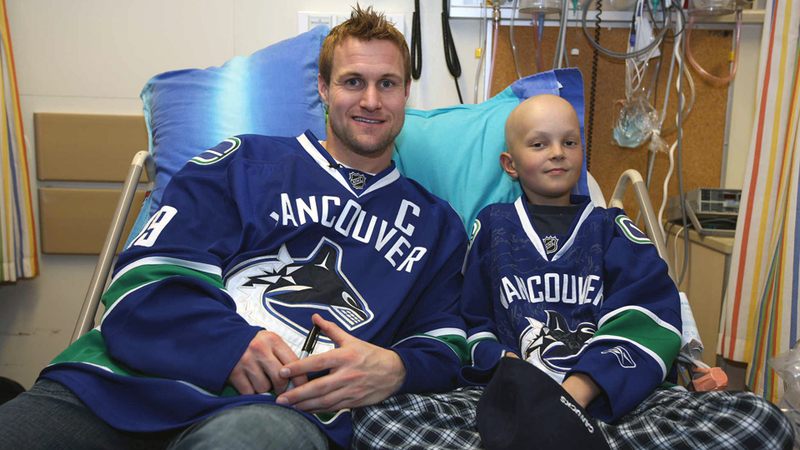 While Naslund created countless magical moments for so many sick children during his time in Vancouver, he also was sure to make an impact on his teammates – quietly mentoring them on how to handle themselves during these potentially uncomfortable interactions. As someone from BC Children’s Hospital Foundation who helped tour the Canucks players around the hospital year after year, Jill Price witnessed Naslund at his finest on many occasions. While visiting one of the most heart-wrenching wards at the hospital, the Intensive Care Unit, Naslund also knew the importance of spending quiet time with the parents, siblings and relatives of the sick child. All in all, Naslund knew what impact he was making in the lives of these kids, but the humble Swede never spoke about it nor wanted any recognition for it. With the kind of philanthropic leadership that Naslund exemplified away from the rink, he will always be remembered as a true community hero in British Columbia.